This weekend was JAM. PACKED! It seems like a long weekend because of how much I did but it also flew by! It started Friday night at Mall at Millennia at the MAC Technique event. I had the opportunity to interview the speaker, MAC's Director of Makeup Artistry Gregory Arlt! Do you think Social Media has changed the way makeup is done or perceived? GA: 1,000%. The short answer is absolutely! It's so amazing, its a cultural phenomenon on so many levels. Basically if you have an iPhone you can be a makeup artist. Well, very generally speaking. There's some really amazing people out there. How do you feel about crazy contour and highlight crazes? GA: It doesn't exist on the red carpet. It's very contour-versial! It's being sent as a message to the world that your face is not perfect, it needs to be reshaped. It's a little of an irresponsible message to send. It doesn't really exist in the celebrity world, in the fashion world. It's an interesting one, do we really need to tell women or girls that you have to change the shape of your face? Did you get to see Beyonce's Met Gala makeup look? GA: I appreciated it. She's a beautiful girl, it literally is #iwokeuplikethis! [...] At least they took a risk and I liked it. A lot of celebrities don't take risks with makeup, so I'm glad she did. GA: It's yes and yes, it's very collaborative. It depends on if its the first time you work with someone or not, for the last 5 years I've been working with Gwen (Stefani). She's a great person to work with. Oftentimes with her it will be super collaborative or sometimes she will come in and say what do you think, I have no idea. [...] Then there are some clients who are very specific. At the end of they day they're wearing it, not me. I don't want to force anyone. GA: I'm a firm believer in timing, it's all about timing. You can never prepare for anything! I started as a professional makeup artist at 19 working at Fred Segal, I worked there for three and a half years. I'm the youngest of all girls, 2 older sisters and my mom, and my dad was an artist. So while other little boys were being taught how to throw a football my dad was teaching me to paint. And it was great! He was always supportive of me and I always loved makeup. In early '93 I had three people in one week tell me to go work for MAC. You gotta listen to a sign like that! So I started working as a traveling makeup artist for MAC, I never worked at the counter, it was so busy that I travelled around doing makeup. In '95 I had a client who worked at a record label and she told me to check out a really cool, new band called No Doubt. She goes, you have to work with the lead singer! And that was the first time that I worked with Gwen! We really clicked, she gave me her CD, she called me but I didn't call her back, then she got famous so I tried to call her back (lots of laughs!). I didn't see her again until 2012, because I had known her hair stylist for many years before. When we met again she totally remembered me! What an amazing story!! It's amazing how timing and destiny work! I got to meet some awesome ladies too, check them all out on Instagram. THANK YOU Gregory for your time and talent! 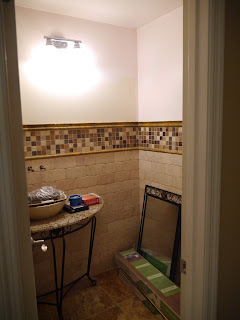 Then Saturday and Sunday were spent remodeling our HOUSE! Yes, I think this is the first time announcing it on the blog, hubs and I got ourself a home :) And we love it so much, we're tearing it apart! Ha! 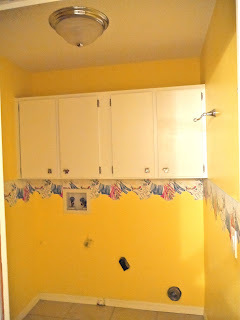 We are redoing the floors, kitchen, and painting most of the rooms. Stay tuned for pictures, updates, and DIYs! 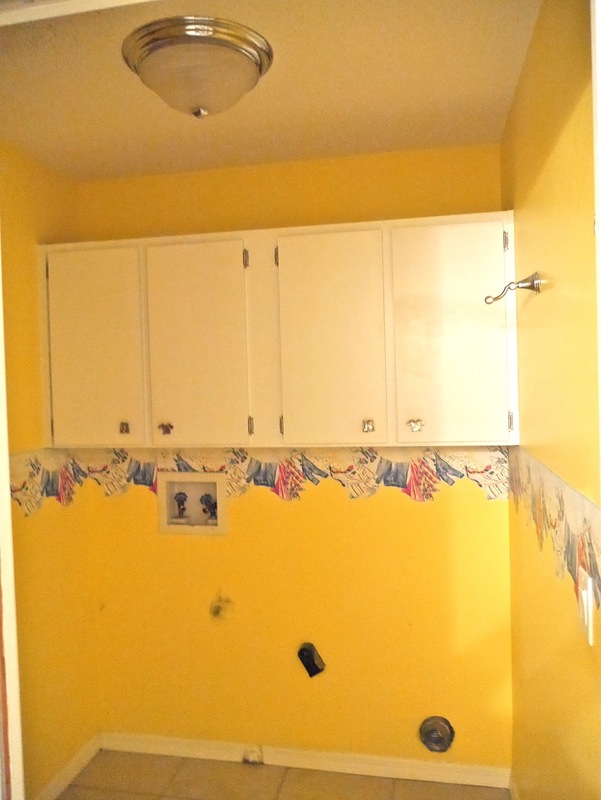 Laundry Room Before & After (BRIGHT, beaming, Big Bird Yellow to awesomely chic navy blue! Yaaaas hun-nay!) Can't wait to accessorize this baby! Your weekend sounded great! That is such an amazing opportunity that you go to interview him.